Jamie Owsley, 21, died in February after being bitten in the neck by a family pit bull. UPDATE 05/14/18: On February 26, 2017, a 21-year old man died after being bitten in the neck by a family pit bull. 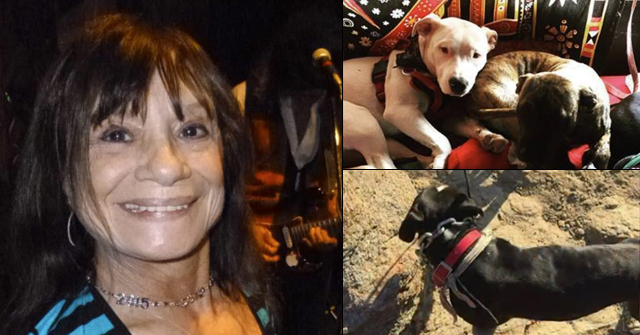 The pit bull belonged to his roommate and cousin Kerry Talburt II. The two resided at 1005 1/2 Jersey Street. The male pit bull that inflicted the attack, Hercules, had bitten three people before delivering a bite that killed Jamie Owsley. Hercules was euthanized on March 7. 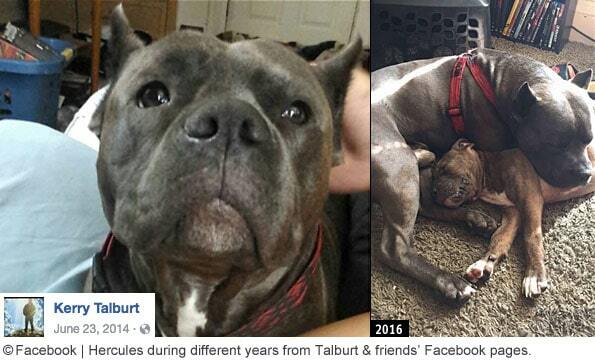 Talburt, however, owned at least two other pit bulls and his legal troubles were only just beginning. On July 8, Talburt was arrested after allowing one of his pit bulls to attack a man. "Police said Talburt had gotten into an altercation with his downstairs neighbor, and Talburt's dog got loose and bit the man," reports the Herald-Whig. Talburt was also accused of pushing his thumb in one of the man's eyes. At that time, Talburt was charged with six felonies: home invasion, aggravated battery, reckless conduct, criminal trespass of a residence and two counts of obstructing justice. Substantial drug-related charges were later added to the mix when Talburt was arrested again on November 20 and December 31, 2017. On Monday, Talburt was sentenced to 15 years in the Illinois Department of Corrections as part of a negotiated plea deal. Kerry D. Talburt II, 22, pleaded guilty to charges of aggravated battery, unlawful possession with intent to deliver cannabis between 30 and 500 grams and a variety of other drug trafficking charges in Adams County Circuit Court. The judge assigned three years to the 2017 aggravated battery charge. Talburt was also ordered to pay $13,476 in restitution. 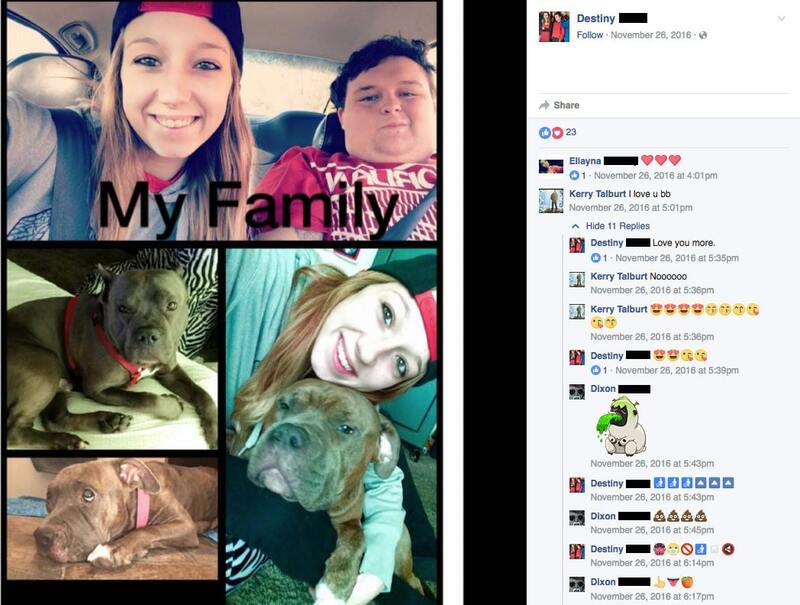 In February 2017, one of Kerry Talburt's pit bull killed his cousin. In July, another pit bull owned by Talburt attacked a man in the face during an altercation. That "altercation" ended in six felony charges, including a home invasion charge, which was later dropped. On New Year's Eve, Talburt was busted on a slew of drug charges. That bust landed him a 7-year jail term alone. All in all, 2017 surely has to be the worst year of his life, making Talburt a token "jailbird" by the age of 22. 11/11/17: In early November, we received the Quincy Police Report of the dog bite case involving Jamie Owsley, 21, of Quincy. Owsley was pronounced dead at 3:38 am on February 26 after arriving at Blessing Hospital. Forensic Pathologist Dr. Denton ruled his cause of death was "penetrating and crushing injuries of the neck, due to a dog attack," states the report. Owsley's death received very little media coverage; no news reports were published after February 27. The attack occurred at his home at 1005 1/2 Jersey Street. The dog involved was one of three pit bulls belonging to his roommate and cousin Kerry Talburt II. The police report states, "[Talburt] heard some rustling in the living room and heard his dog growling. He got up and went to the living room. He saw his pit bull, Hercules, had his mouth latched onto Owsley's neck. 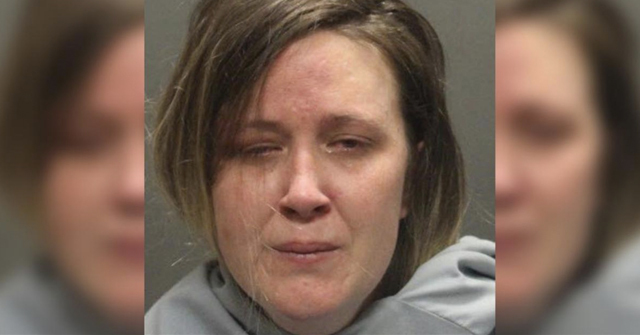 Talburt stated he grabbed the dog and pulled him off, took him into his bedroom, and put him in his kennel." Talburt did not call 911. He called his grandfather instead. After his grandfather arrived, they took Owsley to the emergency room. Family members said Owsley had a history of recent seizures. Between 3:00 and 4:00 pm of the previous day, Owsley suffered a seizure at his apartment. It is believed he suffered another one before the pit bull latched onto his neck, crushing his "larynx and hyoid bone" in his neck. 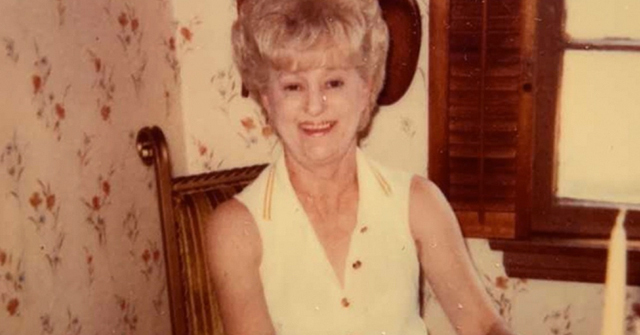 Dr. Denton stated in his report, there were no defensive injuries associated with the dog bite neck injuries, "consistent with Mr. Owsley being unresponsive, but alive during the attack," he wrote. During police interviews, Talburt said he kept three pit bulls in his apartment. He said Hercules, a male blue pit bull, was about 4-years old, Java was about 2-years old and Hoss was about 1.5 years old. "Talburt indicated during the interview that if Java and Hoss were out of their cages, that Hercules would be in his cage because they did not get along," states the report. Talburt said Hercules had bitten three people prior to biting Owsley, including a bite that required stitches. On March 7, Hercules was put down. But Talburt's troubles were just kicking in. On July 8, Talburt was arrested after allegedly allowing one of his pit bulls to injure a man. Talburt was charged in Adams County Circuit Court with six felonies: home invasion, aggravated battery, reckless conduct, criminal trespass of a residence and two counts of obstructing justice. Police said Talburt got into an altercation with his downstairs neighbor. His dog got loose and bit the man in the face. The Quincy Police Department said officers were called to 1005 Jersey on July 8 in response to a report of a 30-year-old man who was bitten in the face by a dog. Police said Talburt had gotten into an altercation with his downstairs neighbor, and Talburt's dog got loose and bit the man. Kerry D. Talburt II, 21-years old, faces up to 30-years in jail if convicted of the home invasion charge. It is a Class X felony, the most serious felony offense in Illinois short of first-degree murder. If convicted of the other charges, he also faces the possibility of consecutive sentences. In October, Talburt pleaded not guilty to all charges. A jury will hear his case in the future. Adams County Court online records show that Talburt is no stranger to criminal legal proceedings. 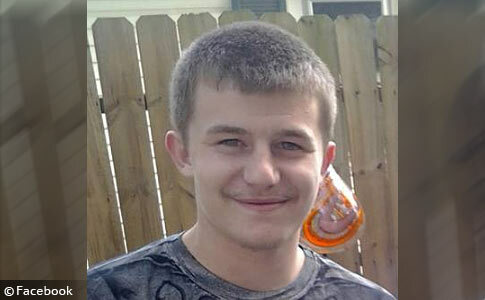 Quincy, IL - A 21-year old man died after a dog attack early Sunday morning. Adams County Coroner Jim Keller identified the victim as Jamie Owsley of Quincy. Police said that a death investigation was underway. Police said they received a call from the emergency room about a person with a dog bite. The attack occurred at 3:26 am Sunday morning at 1005 Jersey Street, inside the two-story brick home. 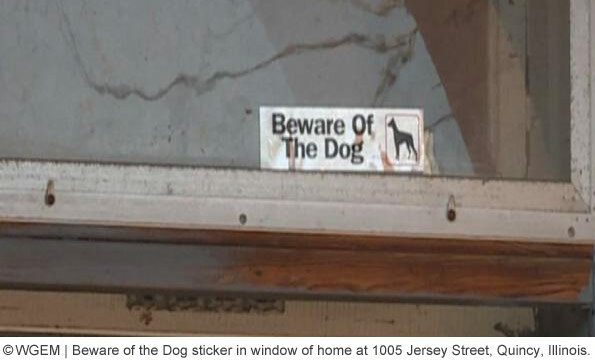 A Beware of Dog sticker was adhered above the front door. No other details will be released until the final autopsy results, which could take up to 2-weeks. In my mind, a "Beware of Dog" sign is a warning worth heeding. Not only is the dog dangerous, the owner is, at the very least, not willing to take responsibility for anything the dog might do. I can't believe the sheer number of people being killed by their own dogs (or by dogs owned by family members). I look at my dog and I just can't imagine her ever wanting to kill me or any of my family members (though I could see her biting an intruder without much effort). Why and how are so many dogs turning on their owners? Are they being abused to breaking point (e.g. using bad training methods like Cesar Millan promotes) or is it some kind of mental illness in certain breeds? For that matter is it a mental illness in some people that they would own a dog capable of killing them? I just don't understand it. My take: Mental illness in some people. You don't need an autopsy to tell what kind of dog did it. Covering up for a pit? Lucu Lencia, you have the best insights. I too have wondered if we're seeing an increase in dog aggression toward their owners because of aversive training methods popularized by Cesar Millan. If so, that's incredibly sad on so many levels. And I also find it surprising that anyone would want to own a dog capable of kililng them and can't begin to imagine my family's current or past dogs hurting us. Anecdote alert: Our 11-year-old Springer Spaniel happily welcomed in a dogsitter who he had never met before when no one was home. She left a note saying how much she loved him. That made me proud for having helped raise such a friendly, well-adjusted dog. I also know breeding plays a huge role–type of breed and what he was bred for as well as decades of careful selective breeding (he's from champion lines with a temperament guarantee). But too often I see comments online of people who think their dogs should harm or even kill someone entering the home or yard. They act like it's completely normal, that all dogs are territorial. Someone else on this blog commented that pit bulls are changing people's perceptions of normal dog behavior. That seems to be true and is extremely disturbing. I think there is a strange adoration some people have for owning a dangerous pet. There was a TV show at one time about people killed by their animals. Is it the lion tamer mentality? Does it give them a self-esteem boost thinking they're communing with nature like in fictional books and movies? Or maybe it's more the macho approach like Millan advocates. Plenty of pit owners' comments online would attest to that. What do you think? In this case, this young man's Facebook page does show a picture of him with what appears to be a Rottweiler puppy about 3 years ago. Perhaps they need a sickly and abused dog to make themselves feel worthy, to receive attention? It certainly isn't because they want to benefit BULLY dogs. Look at the disproportionate suffering they cause when they monger BULLY dogs. EyesOpened I do think that force based training could be a major factor regarding aggression towards owners / family members (there are actually several studies done that found that dogs trained with force / aversives were more likely to bite or display aggresive behaviour). I still think it can't just be the training – I think breed plays a huge part too. With a gentler breed (like most gundogs) perhaps you can get away with force based training but when you get a breed bred for certain types of aggression (guarding / territorial, protective or dog specific aggression) and you train them with force / aversives that dog is so much more likely to turn on you than if you'd trained it with positive methods. Pits have definitely changed perceptions on normal dog behaviour. It's as much the pits themselves as it is people that own them propagating lies about dogs. For example in a neighbourhood with a lot of pits attacking other dogs, I expect most of the victim dogs (if they survive) to become dog aggressive too as a result of the trauma of the attack. Then in these neighbourhoods an observer that knows no better will see lots of different breeds with serious dog aggression and may start to believe that all dogs are naturally aggressive towards each other. I too find it disturbing that many people feel their dogs should kill or bite intruders. Their dog's life is at risk whenever it attacks a human (most people are going to fight back and burglars may carry guns or knives). It worries me that someone might break in and kill my cats and dog while I'm out – my posessions are replaceable but my pets' lives aren't. Unfortunately my dog IS territorial and fearful, I suppose it's part of her genetics (she's a shepherd mix of some sort we think) I may not ever be able to fully train or condition it out of her. I would hope she'd be too scared to attack and would only bark and hide somewhere out of the way of an intruder but I certainly wouldn't put it past her to try to bite (which is why she isn't left unsupervised outside in case a stranger happens to come unannounced through the gate or over the fence for any reason). There's definitely a status associated with ownership of certain breeds of dog. Some breeds have a "macho" image and men who fancy themselves to be big hard men will want one of those dogs to fit their image. The macho dogs are typically aggressive and domineering. Combine the macho breed with the macho owner and the "alpha" type training these guys subscribe to and you have a recipe for disaster. I find most pit owners to be very ignorant of dog behaviour and training methods. The few people I know who own pit types smack their dogs to "correct" them and don't believe in using treats as motivators. I've also heard a lot of dog owners say that certain breeds need corrections (physical force), particularly breeds like pits, GSDs, Malinois, rottweilers and the like. I personally feel that physical force has no place in training and just damages trust between owner and dog but I've been shouted down by these people whenever I try to suggest this. I wouldn't be surprised to hear that it was a 3 year old rottweiler that killed him. They're powerful dogs and at 2 – 3 years is when they're reaching mental maturity and becoming more independent – particularly if not neutered / spayed. Just curious if the Millan badgers can cite one incident where a dog personally trained by him killed a person? The recent spate of internet "educated" dog trainers is most likely a more serious problem with aggressive dogs. When they run out of treats, they lose the dog. Simple as that. A dog bred for aggression is far harder to train with treats. All police , protection and detection dogs are trained using and directing their prey drive, which is genetically bred into these dogs. There is a reason they don't use food to train. Still no update on the breed of dog? Pit bull cover up? Bobbi Whiskers, it's a common misconception that positive reinforcement training only uses food–or that food is needed forever. It's been my experience in general that followers of Cesar Millan and his methods are far less informed about the science of animal behavior and training methods than those who support positive reinforcement. Sure, there are some bad trainers on both ends of the spectrum out there, but science and research support positive reinforcement, which is just better when implemented properly. I suggest you watch Nando Brown's video on YouTube on the Premack Principle. It lines up with what you mentioned about those high-drive police and detection dogs and is part of positive reinforcement training. In the U.S., I've read that trainers of these dogs are beginning to move away from aversive methods, and in the UK these dogs are trained without aversives. A lot of detection dogs especially are trained with toys, which are just another reward like treats used in positive reinforcement. Also, regarding the use of treats, check out the principle of gambling and phasing out treats. A trainer I worked with (who had gone to college and worked with whales and such as well–you can't be the alpha and force them into behaviors) explained that the gambling principle is one of the strongest motivators. Keep reading and researching, and best wishes to you. Lucu Lencia, I'm just getting to your reply now, and as usual I agree with you 100%. I've unfortunately experienced both ends of the training spectrum, and I know that aversive methods and the debunked alpha theory damage the human/canine bond and cause aggression. Thank God I've learned a better way, and my dogs since then and our bond have been better off for it. Pit bulls dont have a "brain issue" or a mental illness that causes them to act aggressive. It is their normal behavior. Even the friendly ones are OVERLY friendly. The licking that goes on for hours. The tenacity that allows them to hang from a spring pole all day is something they're born with. I saw a pit run around the dog park with three tennis balls in his mouth for over an hour. He was doing it when I got there and still doing it when I left. They don't let go. When pit bulls attack,they're just doing what they're inclined to do. They were made for it. It isn't a "fault" or an abnormality in a pit bull. Leeanna, if you tried reading the article before making a judgment about it you'd understand that the reason this is normal behavior in pit bulls and not other dogs is because their brain function and structure is different. Cesar Millan doesn't promote or use abusive training methods but lots of people misunderstand what he does teach and use harsh or abusive tactics in an effort to copy his techniques. 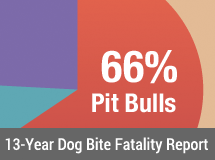 The pit population has been rising so of course lots of their owners and family members are being killed. Just a matter of pit bulls doing what they were bred to do. Jaloney — we don't know. But we were in touch with the local news source for months asking them to follow up. Our last exchange with WGEM was October 30. That is the only email they never responded to. So we filed our own FOIA after that. 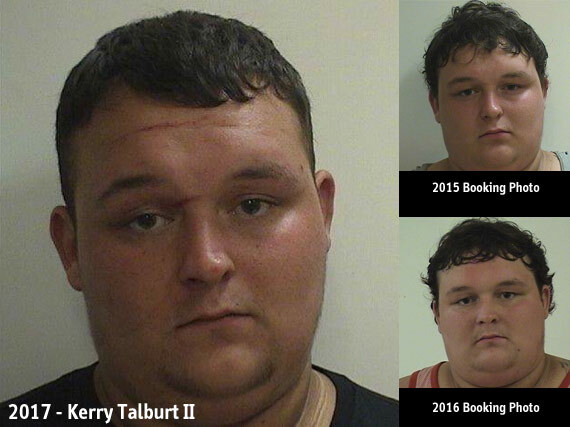 It was research we were doing in late October that led to finding Talburt's July arrest. After finding that, filing a FOIA was a no brainer. I've seen more than one article about a criminal telling his (occasionally her) pit bull to attack someone. At times the dog attacks the owner (because pit bulls are so "smart," "eager to please," and "loyal," don't you know). Natasha, I appreciate your comment, and I think we'll have to respectfully agree to disagree. I've done a lot of research into dog behavior and training and into the methods Cesar Millan promotes. Not only has his alpha theory been scientifically debunked, but also many trainers decry his methods as abusive. I agree with them. But I do agree with you that lots of TV viewers take what they see on an edited show and no doubt distort the methods. And I very much agree with what you said about pits doing what they were bred for. Christy D, Hercules is a pit bull with cropped ears. Identified by his owner as a pit bull and identified by police as a pit bull in the report and in taped interviews with the owner. The owner only owned pit bulls. That was his preference. Mastiffs, such as the cane corso and presa canario are much larger and have distinct mastiff qualities like deep jowls, looser lips and often folds/wrinkles. The fighting breeds certainly share characteristics; they are derivatives. We don't always get perfect photos from Facebook pages either. Here is another one of Hercules (middle left) seen a few months before the attack. Talburt is upper right. The gal is his ex-girl friend who was bitten by Hercules and had to receive stitches (she was one of the three previous bite victims). These are all three of Talburt's pit bulls; two males and one female. PIT BULLS (& OTHER SIMILAR BREEDS) SHOULD ONLY BE HANDLED BY EXPERTS. I HAVE READ SO MANY COMMENTS BY PEOPLE WHO MAKE EXCUSES FOR THIS BREED. ONE FELLOW TOLD ME I WAS AN IDIOT & THAT A PIT BULL IS NO MORE DANGEROUS THAN A POODLE. I WILL TAKE MY CHANCES WITH ANY POODLE, I TOLD HIM. A GUY LIKE THAT WOULD PUT HIS FAMILY AT RISK JUST TO PROVE A POINT. THESE DOGS ARE BRED TO FIGHT. THEY ARE NOT THE SAME AS A POODLE, OR EVEN A GERMAN SHEPHERD (WHICH I USED TO OWN).